The Lifting Section are a highly skilled voluntary workforce and can lift boats up to 5 Tonnes and 9.5 metres. Lifts are undertaken under the supervision of the owner and only when the owner is present. Owners are expected to assist on one other session in addition to their lift-out. The space available for winter storage of yachts is limited and it may be that there is a waiting list. Please email the section organiser for further information. About 14 years ago some members got together to try to resolve the best way to get cruisers in and out of the water each end of the season. A four-wheeled trailer was used at first but it was very difficult to get a floating boat positioned exactly right on the trailer. Other sailing clubs were visited for ideas and eventually we had built to our specifications a large travel hoist. Two suitable strops are passed under the boat ashore and hooked on to four chain-blocks fitted to the top bar of the hoist. 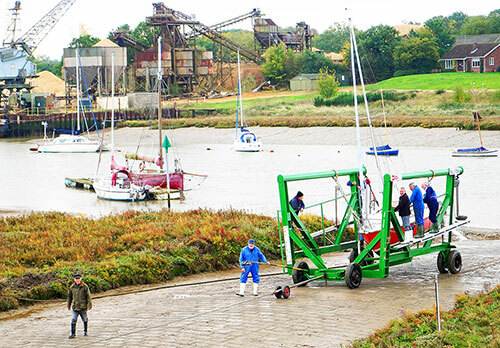 The hoist, with the boat lifted well clear of the ground, are then propelled to near the water by a small tractor. To avoid the tractor getting in the salt water the hoist is attached to the front of the tractor by a long cable and lowered down the slip into the water by the tractor. The boat is allowed to float free. This hoist allows more control of the boat during launching/recovering. The sequence is reversed in the Autumn when hauling boats out. All the equipment used is safety certified and working procedures developed to eliminate, or at least minimise, the risks of the operation. Most masts are unstepped for winter storage. Over the years the equipment has been well maintained and updated – a more powerful tractor was obtained a few years ago. We have been fortunate to have amongst our members an experienced retired boatbuilder who managed working boatyards for most of his life. The operation of the Lifting Section is run on an entirely mutual self-help basis. To have a cruiser launched/recovered the owner has to attend and help on at least two ‘Lifting Days’ other that his / her own boat’s day. It has been the custom for many years for boat owners to provide, on the lifting day, a cake for the hard working gang’s tea break! All members of the section sign that they have read, understood and will abide by our set ‘Procedures’. The normal maximum weight of a boat lifted is about 4 tons and the group usually moves 26-32 boats each season. Over the years a lot of experience has built up and the movement operations are usually fairly slick.